Decorating your business with custom wallpaper is a highly effective way to communicate with your customers. Whether it's a specific message, or an attempt to set a mood or environment, custom wall murals are an original and exciting way to brand your space. We've done a lot of work with restaurants, producing custom wallpaper ranging for an international diner in Atlanta featuring imagery from around the world, to murals for nationwide chains such as Sharky's and Buffalo Wild Wings. Restaurants just getting started really benefit from our custom wallpaper services, as our meticulously printed wall murals lend an air of professionalism and longevity far beyond the average start up. 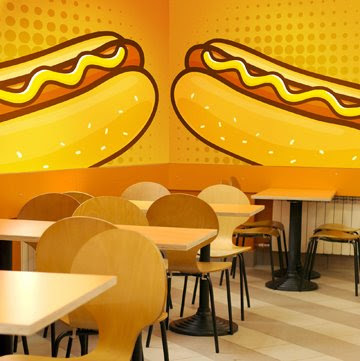 What's more, as our digital wallpaper services are completely custom, you can have a mural that's fun and light hearted like the hot dog wall murals shown, to a mural that is more sophisticated and elegant, all in keeping with your restaurant's theme and attitude. Contact us to discuss your options in outfitting your restaurant with custom wall murals that are sure to impress your clientele, and keep them coming back for more. this hot dog design is so unique, it is lovely with the dinner. over all you have a very beautiful and unique wall papers.